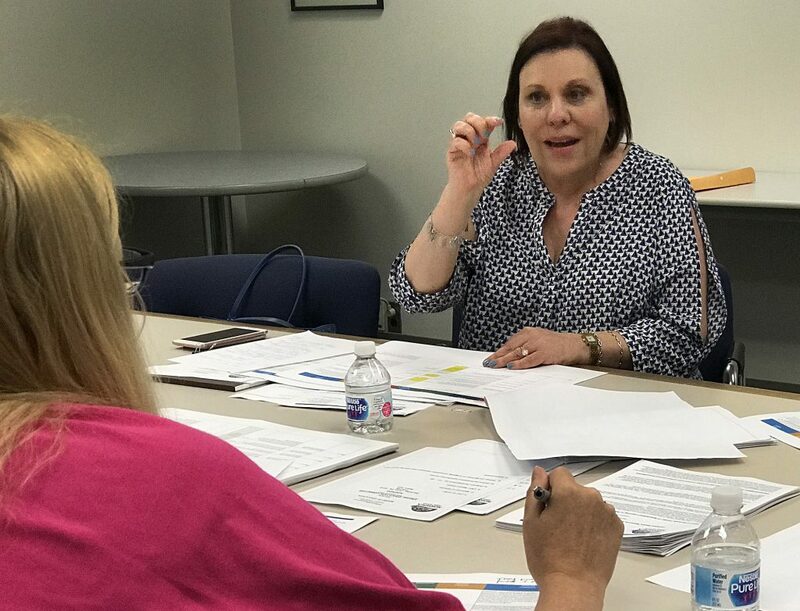 Norwalk Chief of Specialized Learning and Student Services Yvette Goorevitch speaks to Board of Education member Barbara Meyer Mitchell, June 28 in City Hall. NORWALK, Conn. — Norwalk Public Schools is hiring 17 teachers to improve its Special Education offerings, Yvette Goorevitch said. The new staffing is one of many changes in response to the scathing 2015 “CREC report,” which called Norwalk special education classes understaffed and underfunded, and in 2016 inspired a three-year $3.6 million Special Education Transformation Fund. NPS has just completed its second year of the transformation fund, which budgeted spending $1.2 million a year to correct deficiencies, establish more services in-house, and reduce outsourcing. Goorevitch, Chief of Specialized Learning and Student Services, at the June 28 Ad Hoc Special Education Committee meeting delivered the latest update on efforts to address criticisms repeatedly made by CREC, the Capitol Region Education Council. She provided a chart, with 15 of 55 goals marked in yellow to signify that they still need work. Goorevitch took over the Special Education Department a year ago, after the departure of the previous director, Lynn Toper. When Goorevitch began work in 2017, staffing decisions had already been made. This Spring the caseload for staff members was carefully analyzed and more teachers were recommended, Goorevitch said on June 28. Goal 1.8 calls for analyzing SpEd teacher assignments and caseloads and making recommendations for 2016-17 budget and staffing assignments. Goorevitch’s chart shows this was completed June 25. Special Education is federally mandated in accordance with the Individuals with Disabilities Education Act (IDEA). Students are assigned services through a Individualized Education Program (IEP) developed by a Planning and Placement Team (PPT); Norwalk has not been in compliance in multiple ways, Goorevitch said. One school is seeing a reduction, a half-staff member, two schools are remaining unchanged, and the rest will have more staff, some with a half-staff member and some with as many as three or four positions, she said. The expansions are being made via a formula that evaluated needs and left growth for new children to be identified during the school year as needing specialized services. “I really think that I believe that with the increase in staffing and the two SLPs we will not be in an out of compliance situation with speech language next year. It was a continual, continual problem,” Goorevitch said. The positions are funded by both the Transitional Special Education Development Fund and by savings in the BoE’s general fund, Goorevitch said, in response to a query from Committee member David Heuvelman about whether the positions are sustainable. A goal of the SpEd investments is to create in-house services to replace expensive outsourcing. Norwalk Public Schools Chief Financial Officer Thomas Hamilton in April said Special Education costs were down 10 to 15 percent, a $2.2 million decrease from the previous year. Goorevitch on June 28 said the reduction is just under $2 million but may be slightly higher when the books are closed on the fiscal year, which ended June 30. Another three positions will be paid for by the IDEA grant, and some of the new positions are for new program development, she said. Goorevitch said NPS has signed a contract with a SLP provider as a backup, and will “absolutely not” see what Meyer-Mitchell called “a repeat of what we have seen this year” when some students did not receive needed services. Much of the conversation revolved around staff development, with “recruitment, hiring, supervision, training, scheduling, and retention of high quality special education staff” being listed as a goal in the CREC report. “As the district corrects the problems of the CREC report, and as reputation of the district increases, as the caseloads become manageable and as the word spreads that this is a good district to work in, I think recruitment will become easier,” Norwalk Federation of Teachers President Mary Yordon said. Goorevitch said she agreed, based on her experience. She also mentioned that CREC had recommended adding administrative staff to the Special Education office, and said four additional people are at work with an evaluation planned for CREC’s proposed fifth staff member. Other comments in the report revolved around professional development. Goals 6.3, 6.4 and 6.8, which concern parent relations, are listed as being “in process,” with Goorevitch explaining that she created a “PAC-e,” an expanded Parent Advisory Committee, with the goal of merging various parent groups into a district-wide Parent Teacher Association (PTA). “We haven’t gotten there this year … for a variety of reasons. And I think that I underestimated the toxicity, the anger, the lack of communication,” she said. Federal rules require that every few years districts administer a 32-question survey of parents’ involvement and satisfaction. NPS is not scheduled to conduct the survey for several years, but Goorevitch has contacted the State Department of Education to request that NPS voluntarily conduct it this year, she said. Goorevitch replied that she felt the district needs a disclaimer to specify that NPS isn’t endorsing private contractors that SpEd Partners may have as speakers, just alerting parents to the group’s availability. SpEd Partners, which was established in 2011, can’t get a list of parents due to privacy laws, and could be included in a general list of “opt in” programs, Heuvelman said. Meyer-Mitchell commented that implementing a solution will help heal the relationship between the group and the district. Heuvelman, who is the father of a SpEd student, pressed Goorevitch about compliance issues. Meyer-Mitchell suggested that a flow chart might help parents understand the compliance process and Goorevitch agreed that it could be done. Teachers have been hired to work as compliance monitors and are being paid stipends to do this extra work after hours, Goorevitch and Yordon said. A supervisor monitors the fidelity of the IEP, Goorevitch explained. “That speaks very strongly about the quality of the IEPs that have been written within this district and that the training for that needs to be stepped up,” Heuvelman said, with Goorevitch replying that Special Education administrator Stacy Heilgenthaler is in charge of district-wide compliance monitoring and is continually training compliance facilitators, and Maureen Sullivan is in charge of improving assessments that lead to IEPs. The flowchart suggested by Meyer-Mitchell would help parents understand, Heuvelman said. Board member Sarah LeMieux turned attention to the Committee itself, pointing out that it was created to monitor compliance to the CREC report and is due to expire at the end of next year, when the three-year special education turnaround effort ends. It might be a good idea to keep the Committee going, LeMieux said. Meyer-Mitchell agreed. “I think it would be a good idea to move to a permanent Committee because SpEd represents 25 percent of our budget. So, as goes SpEd, so the school district. It needs oversight,” Meyer-Mitchell said. “It might be interesting in a year or two to commission a new CREC report to see how we’re doing, or another outside audit from CES (Cooperative Educational Services) or some other organization,” she said. “I think that is on the superintendent’s proposed three-year plan,” Goorevitch replied. Committee Chairman Erik Anderson was not present at the June 28 meeting. Just a clarification on that last couple of paragraphs. I was speaking historically that previous boards and administrations allowed SPED to become unmonitored, out of compliance, not in keeping with best practices, and expensive. This board worked hard to get funding to turn SPED around and has had a committee to review implementation of the CREC report recommendations. I was in no way saying that this board isn’t focused on these issues. Rather I was pointing out that we should have a standing board committee to oversee what is essentially 20-25% of our NPS budget. Oversight breeds better results. Previous boards for many years did in fact ignore special education, as mentioned above. But the previous board, in December 2015, presented the Mayor and the Council with a three year plan to finally overhaul special education in Norwalk. The previous board and the Mayor/Council worked out a complicated funding procedure that involved both the board and the city. The current board, elected last November, has continued to implement the plan.